in these OPSC latest jobs Recruitment 2017. Online application form will be accepted from 17-11-2017 to 18-12-2017 through OPSC website of www.opsconline.gov.in for these Assistant Agriculture Officer jobs in Agriculture department of Odisha State. All the vacancies are reserved for scheduled tribe candidates of Odisha state only. Candidates will be selected based on career marks and interview for this OPSC Assistant Agriculture Officer Vacancy. It means candidates who are having good merit they are only selected. Age limits, application procedure, pay scale and other details about this OPSC Assistant Agriculture Officer Jobs is given below. 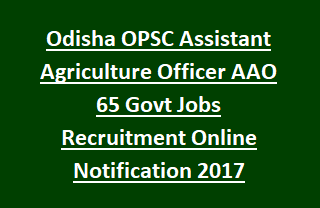 There are total 65 Assistant Agriculture Officer jobs in this OPSC Recruitment 2017. All the posts are reserved for ST candidates. As on 01-01-2017 candidates age must be under 32 and above 21 years. Degree in Agriculture or its equivalent qualification is required. Candidates will be selected through based on marks and interview. For Intermediate Marks 25% and for Degree Agriculture Marks 50% will given. Based on prepared merit list candidates will be called for interview. There is no exam for this OPSC Asst Agriculture Officer vacancy recruitment 2017. Online applications only accepted through www.opsconline.gov.in website from 17-11-2017 to 18-12-2017. Provide all the information and submit the application form. Interview dates will be updated in official website of OSPC. Candidates will receive alerts to their given mail id or mobile regarding updates about OSPC AAO Jobs recruitment 2017. Apply Online here for Odisha PSC AAO Jobs Recruitment 2017.